Benjamin is hiding the Lamb ears. He says they are very soft and they tickle. 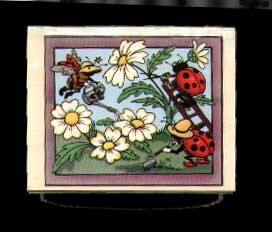 There he is again hiding in the primroses. He says he loves primroses. He enjoys nibbling the tiny strawberries later on. This is his favourite volunteer. 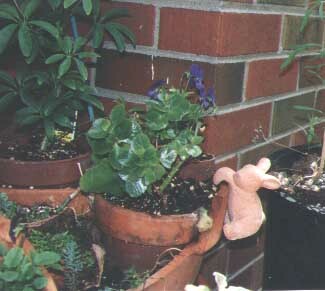 She had a really big terra cotta pot that crack and "landscaped" it with sedum and rockery plants. I had a pot that loved crack so I did the same. I because I don't have a space that is cool enough but won't freeze I have found i can't over winter my pot but repot it from the rockery plants and volunteers and houseplants in the spring of the year. Elizabeth's Page is really great. Three Terracotta Bunnies Stephanie bought me. I wonder what Summer 2000 will bring. Well I loved them so much I made my own. These are my terracotta people. Instead of playing chess, they are having a nice cup of tea. 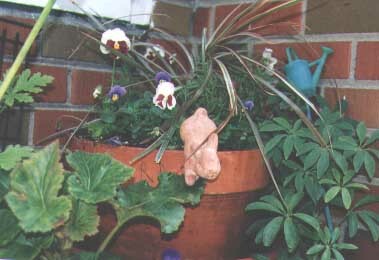 I fashioned them out of terracotta pots. 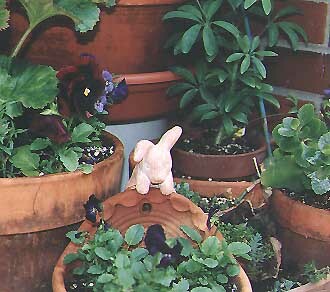 The terracotta tea set is mine I have had for a few years. Their Names are Charlie and Mabel. 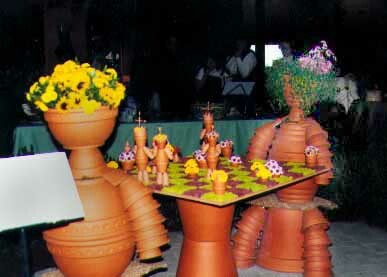 Their arms and legs are made from jute rope and small terracotta pots. Charlie & Mabel have Hens and Chicks for their hair. in front of the Tool Shed. Charlie & Mabel have hair of Hens and Chicks. Virgo's Aussie Garden site in their folly links. This is a picture of her folly!